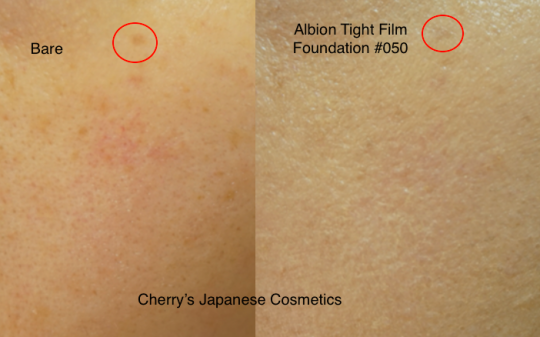 Albion is going to sell new foundation: Tight Film Foundation. I (Cherry) got a sample of this product. Let me share my review with you. This foundation is cream foundation. Sorry! I touched the corner of the sample pack accidentally, but I suggest it is easy to know this is not runny, but so soft foundation. And remember the freckle on my arm. I am applying this foundation on my arm directly, because this foundation is “no need of foundation primers”. Let me spread it on my arm. Because of the lighting the color is a little bit different. See the wooden background, it is just a small difference. It was a chilly day, and got gooseflesh! Yet I hope you can see my uneven skin color is totally even color. I had tried lots of foundations, and there are many full coverage foundations, but in this price level of this Tight Film Foundation, there are hard to find such a good full coverage products. 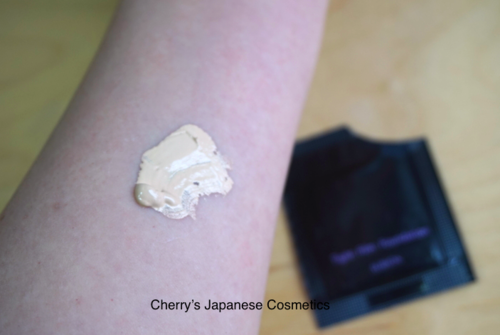 The color is #050, beige, the standard color for Japanese skin. This is the very my arm color. 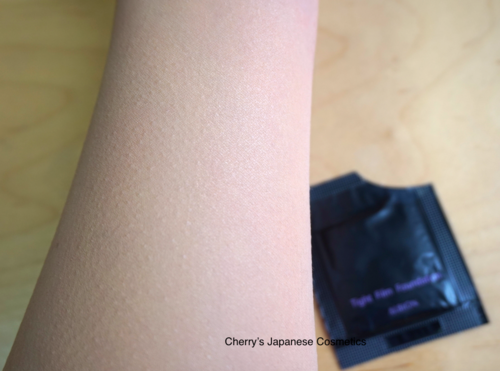 See also Cherry’s Shade Swatch of Albion Gel Mask & Tight Film Foundation. As Albion says, this foundation has an effect of sliming your face by makeup. Frankly to say, I have not felt my round face was vividly slimmed. Yet I have to tell you about the torn thing again. I had tested so much foundations, and there are so many great foundations with full coverage, like SUQQU Frame Fix Cream Foundation N or Albion Excia AL Superior Cream Foundation. But they are not cheap products. Compared with them, this is the best, yes more than I had expected on the view point of coverage cost performance. Great product. Wanna see how it covers? It is my cheek, 31st of Oct, 2015. I marked by red circles you may easier to see the same freckles. You may see you my skin is better conditioned look, and (almost) fully covered my reddish problem you can see in the bare picture! Unfortunately, in this picture, I do not think you find how it is radiant. In my eyes, this is one of the most radiant (not glow!) foundation as I had tried. The sade of #050 is too dark for my preference. But darker foundations are easier to hide your freckles. I was so happy to find this, but I have to say again, for me, in person, this has too strong perfume. I know some like those, but not for me. If you are a person who doesn’t mind the perfume in cosmetics, and looking for full coverage with affordable price, this is one of my recommends. You may see the finish of the pictures above. On my drier arm, it seemed as matte to natural. Yet some Japanese reviewers are saying this as natural finish. But compared with other foundations (none of they are matte), this looks radiant, how to say, it is shining. Maybe its up to the skin condition. I forgot to tell you whether this was oily or dry. It is a little bit oilier product, I am sure. On my face, I did not feel my skin is drying because of this foundation. And it was not melting down on my face with this dry air. Please order from here: Albion Tight Film Foundation, or visit our JPY Branch!